Reserch In Motion (RIM) on its way to introduce its own new BlackBerry Tablet, named BlackBerry PlayBook soon in markets.The new BlackBerry PlayBook Tablet will be available in US markets by the early quarter of 2011. Recent update that comes over in Internet is about the Price details of new BlackBerry PlayBook.According to the available information the new BlackBerry PlayBook Tablet comes with a price tag that starts at $399 ( about Rs 18,200) for 16 GB version.The price tag will be raised to $499 (about Rs. 22,800) for 32 GB model and for 64 GB version the price will be $599 (about Rs. 27,400). 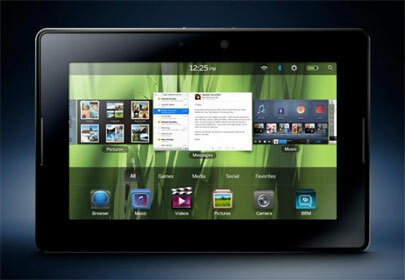 New Upcomming BlackBerry PlayBook Tablet comes equipped with a 7-inch Capacitive Display with a resolution of 1024 x 600 pixels along with multi-touch capabilities and is powered with a 1GHZ dual core Processor along with 1 GB RAM module.BlackBerry PlayBook comes available in storage options of 16GB, 32GB and 64GB. New BlackBerry PlayBook Tablet Features 5 mega pixel HD rear camera, 3 mega pixel HD front facing camera for video calling, Wi-fi 802 b/g/n, Bluetooth 2.1, DLNA connectivity, micro USB and micro HDMI ports.BlackBerry PlayBook tablet also includes supports for MP3, AAc and WMA, Adobe AIR apps, HTML5, Flash and OpenGL OS. BlackBerry PlayBook runs on QNX operating system.The global launch of BlackBerry PlayBook is expected to happen by the second quarter of 2011. Tags:-BlackBerry PlayBook Tablet versions, BlackBerry PlayBook Tablet price, BlackBerry PlayBook Tablet launch, BlackBerry PlayBook Tablet us launch, BlackBerry PlayBook Tablet os, BlackBerry PlayBook Tablet india price, BlackBerry PlayBook.